Hey guys!! So your frustrated Artist is back once again. And in this episode of @Yannn's Art Journey, I would like to share with you guys my 2018 Art Summary (or more likely I want to say my 2018 Art Progress). I know this is kinda late already but I don't see any harm in posting it here (besides I'm still coping in making blogs here in Bitlanders, some technical or broad topics are too much for my brain) So last year, before the year ends, I saw so many artist in Instagram and Twitter posting their 2018 Art Summary and to tell you honestly I am so amazed by just seeing their works (and feel a bit of sadness because I know I can do better last year if only I just put some time with my craft) Oh well, we can still make progress this year right? Tryin' to stay positive despite my anxiety because I promised to be a less toxic human being this year. Please refrain from expecting too much because the following Art might not reach your standards (not yet, yes I highly believe in Progress). Another thing is, I'm still imprisoned with Traditional Art meaning, physical tools and materials. But I promised myself that this 2019 I'd go out to my comfort zone and try to study Digital Arts. Surely it is a long way to go, but that will not hinder me to pursue what I really love. January 2018, I have no idea how to start my journey at the beginning of the year. Well, I'm still looking for some Motivation and Inspirations. 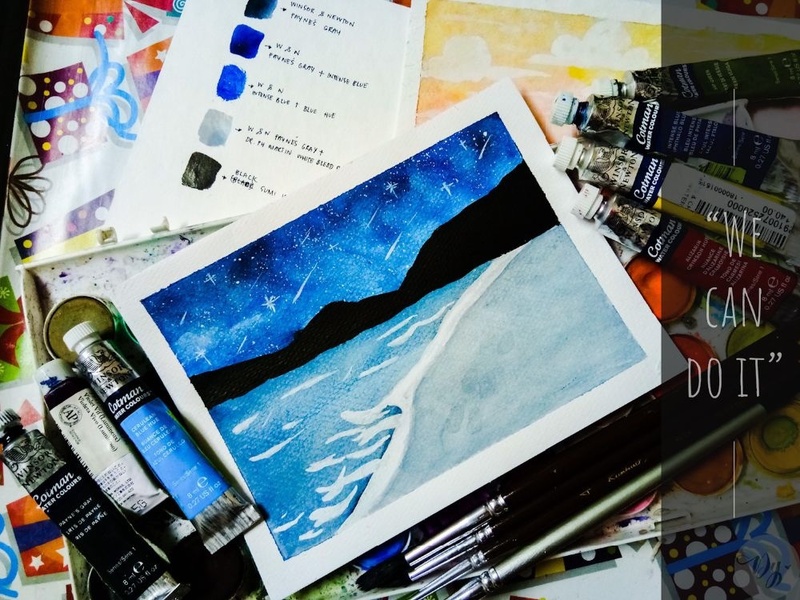 Until I bumped into Steemit and saw a contest of Sir Sensei called “#Drawitbetter”. And surprisingly, the theme for that week is all about mountains. The contest is boosting my lazy hands to start getting things done. 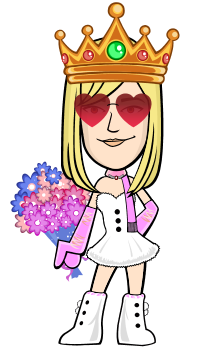 And with all enthusiasm, I participated in the said contest. 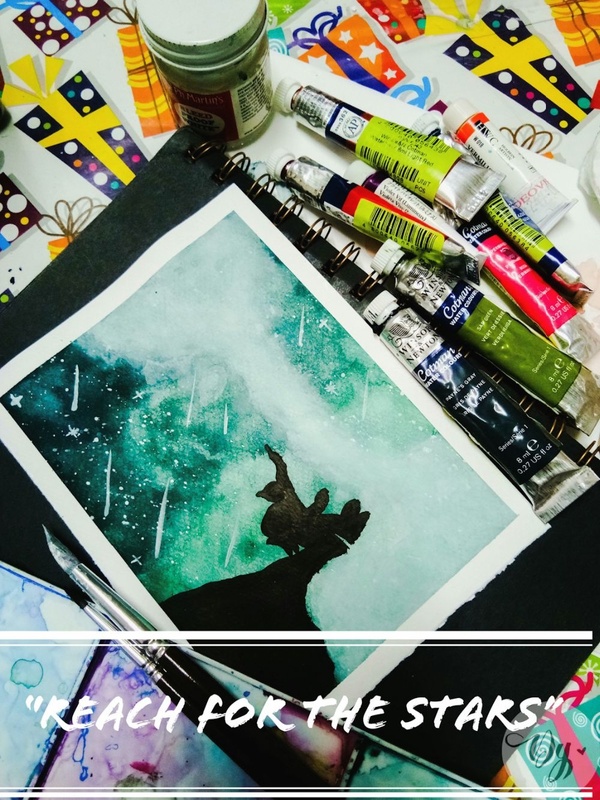 The mechanics of the contest is simple, you just have to make a post of your art (relating with the theme of course) and how step by step it has been done. 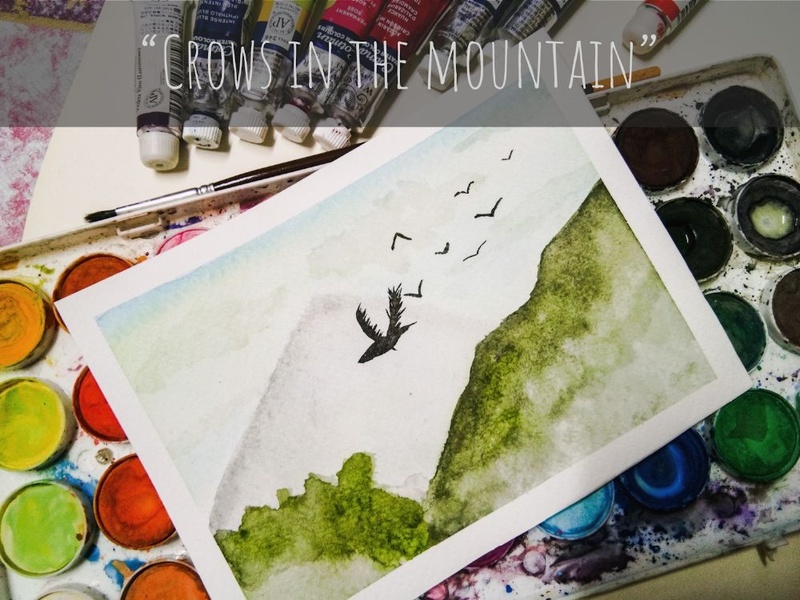 If you want to see the step by step progress you can check out my post in steemit Drawitbetter contest 11: Mountains- Soaring crows. Now before getting this landscape done, my ultimate Inspiration for this post is the sports anime called “Haikyuu!!”. This is a scene from season 2 ending OST. I can't get enough with this scene because, by that time, I am also rewatching the said anime. Perfect timing right? Not much similar to the first one, this landscape is also inspired by Haikyuu and the song Fly high by Burnout Syndrome. 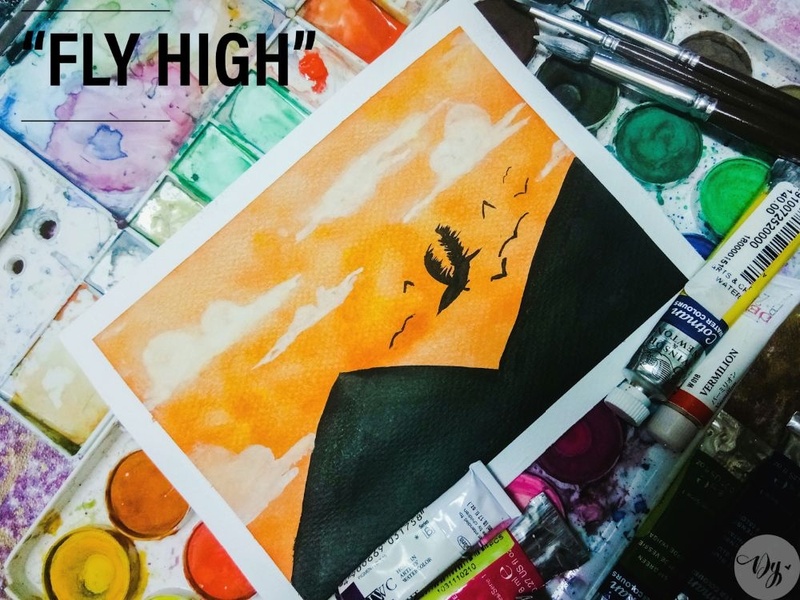 Fly high is popularly known as the tag line of the High school volleyball team, Karasuno. They are known as the “falling crows” when their time of victory passed. But started soaring high when the first years enter the team and the whole Karasuno started flying high again. Here's a preview of the said song. Oops enough for weeb stories, I remake this Artwork because I wanted to try something new. Out of my comfort zone. February 2018, I bought a Holbein Vermillion watercolor and man it was expensive for a little watercolor tube. The color is so bright and solid, so I wasn't able to use it more often. But that time I wanted to try it, like experiment something about it. So I decided to make this landscape. The strong hue of the paint is so much to take that I have I just decided to make silhouette mountains and crows in it. But nonetheless, I am happy with the result of it. You might hear this quote somewhere right? It was Buzz Lightyear from Toy Story. This Artwork has a similar touch of the movie but my greatest inspiration for this work is a post from one of the artists I look up to. It was @Randolfigraphy of Instagram. I've been following him on Instagram for quite some time right now and I must admit that he's one of my favorite Galaxy Artist. Then just recently he started posting works Inspired by Makoto Shinkai's movie!! The dude right here loves sensei's movies as well. Go check his account here @randolfigraphy. For someone who loves Japan so much and astonished by how beautiful Cherry blossom is, I've been always amazed by how Artists' paint cherry blossoms. 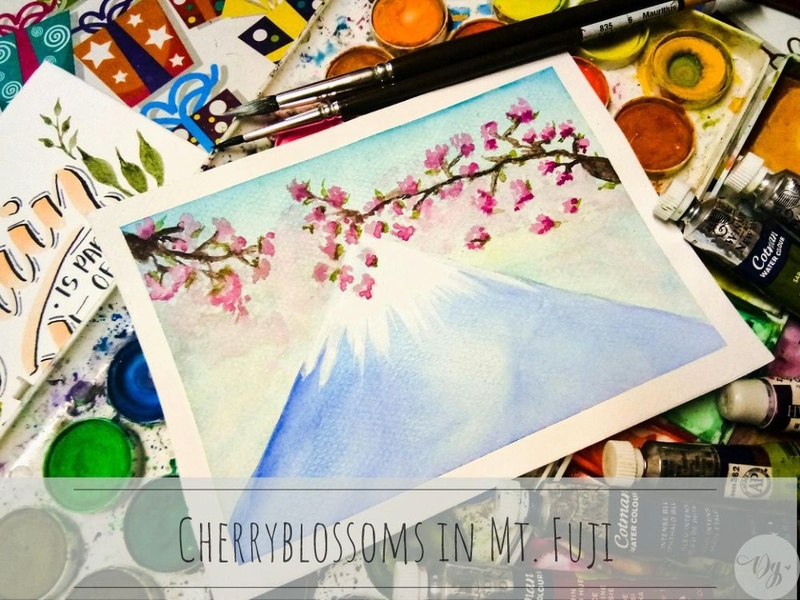 It was way back in 2017 when I learned how to paint cherry blossoms and it was in Zig Calligraphy Fair. An artist made a live demo on how she make cherry blossom. And since then I started exploring and tried to amplify her tips in painting sakura. Her demo really helped me a lot in studying the said scape. This might be my favorite artwork for 2018. I mean there's so much story in one picture. Last June 2018, I can still remember, almost every morning I was listening to a compiled playlist of Shigatsuwa Kimi No uso or Your lie in April in Spotify. It was one of my favorite anime that really touches not just my heart but also my soul. (You have no idea how many times I cry for this series). It was a Slice of life with Classical Music in its type of genre. And I guess being a sucker for Classical Music makes this Anime hit me harder than anyone. I had my favorite songs in the series but there is this one scene at the end that really squeezes my heart and left a tear in my eyes. Spoilers: My artwork shows that someone is playing a piano and violin (I know it hardly shows but it is). It was the protagonists, playing together for the last time. The concept was like, they are both in a dream saying to each other “Again”, I want to perform with you again. Although the series has a specific scene where one of the protagonists said “Again” to the other protagonist, this is my version and I guess the most suited concept for the song. This is my first Shigatsuwa Kimi no Uso artwork, and I must admit that I really had a hard time making this one. But I guess every hard time paid off because I am happy with the result. Yay!! Does the title sound familiar with you? Yes? Nah? It was from the Movie Kimi No Nawa also known as Your Name. 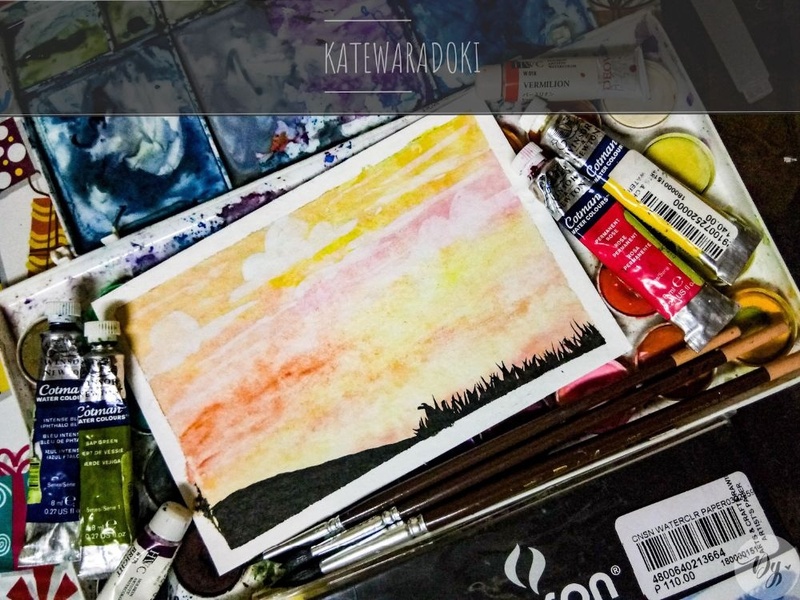 As I asked Google about the meaning of Katewaradoki, it was Sunset or twilight in a local dialect in Hida Japan. But also they referred it to something supernatural happenings (and it shows in the anime where Taki drank Mitsuha's musubi and they switched bodies). I've always been fond of skies, sunsets and night skies and Kimi No nawa is one of my ultimate reference and Inspiration. Makoto-sensei really did well on the cinematography of his movies. Last July 2018, as I continue to explore my Vermillion watercolor paint, I also discover this postcard type paper by Canson. And unlike the usually watercolor paper, I use this one has a different texture that limits me to play with water as much as I wanted to. But still, I give it a shot since I bought it. And I ended up loving this artwork! Although I need to control the flow of the water I guess I was able to pull up and shows the quality of the paint. Phew! I also used this artwork as an entry in “All about sunset” contest in Steemit. Actually, it was the time where I asked the host of the contest if the artwork is acceptable. And she gladly accepts my entry (you know I still need to work on my photography skills so I don't have any good photograph sunsets). Sounds like it was a motivational quote right? Well, it is! But you might get confused what's the connection between this quote and the seaside right? There's this song entitled “Can Do” by Granrodeo, it is such a bop! And it is one of the OST of my all time favorite sports Anime “Kuroko no basuke”. It's a basketball-themed series that focuses on the protagonist Kuroko Tetsuya who's ability is below average when it comes to the said sport. But this boy didn't let that hinder him from being the best in Japan. Together with his team, The Seirin High Basketball Team they worked hard to eliminated the best of the best teams in Japan. In season 2 of the series, their Coach decided that they will have their practice camp at the beach. That is to exercise and strengthen their legs. This is my Inspiration in my artwork above, it is where two of the protagonists, Kuroko and Taiga were jogging in the middle of the night on the seaside. (Ahhhh how I miss this Anime so much). This is also my first ever Kuroko No Basuke Inspired artwork (since it's a basketball-themed anime I rarely have some reference from the series). I always wanted to learn how to paint seas and waves but I guess I am not at that level yet where I can create realistic waves, maybe soon? From a month of being Hiatus in doing watercolor, I am so grateful that one local and historical movie brought me back to the track!! Do you know how hard it is to go back, gather yourself together and find some motivation to do what you want to do? Well, that's quite difficult for me. Aside from lack of motivation, I am also drowning in work stuff so I have a little bit of my time to spend it with my craft. But I am grateful that this movie brought the fire burning in my heart. 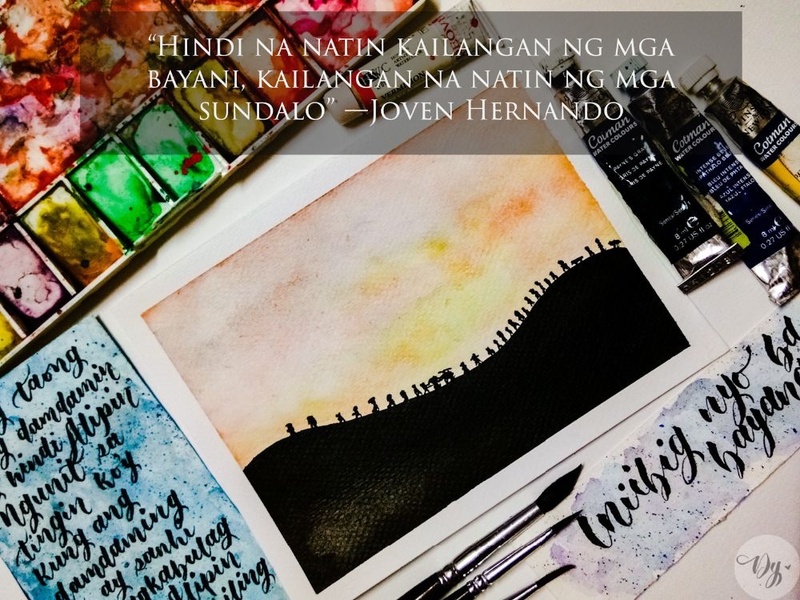 One of the first landscape I made inspired by Goyo is this sunset silhouette scene, where the troop of Del Pilar and Aguinaldo travel on their way to Tirad pass. I guess everyone who saw the movie thinks that this scene is iconic. So many emotions in one picture. Also, I thought that Joven's words really fit this scene. We don't need any heroes right now, what we need are soldiers. Soldiers, our nation indeed need soldiers that time. Soldiers who will fight not just for the glory of our nation but will fight for the freedom with peace from the Americans. 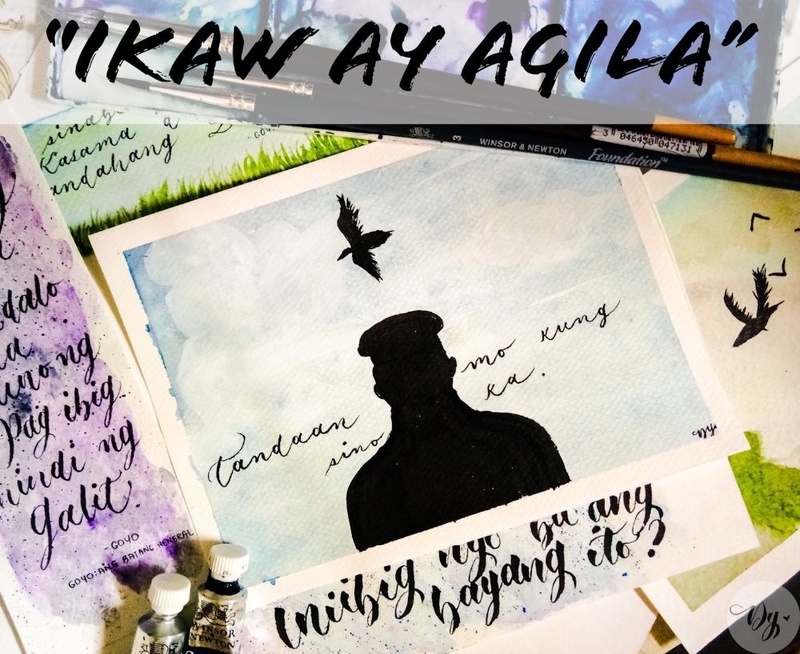 I posted this artwork in my Art account in twitter and little did I know it has been noticed by the cinematographer of both movies, Heneral Luna and Goyo: Ang batang Heneral. It was Sir Pong Ignacio!!!! My heart wants to burst in Happiness!! Also, I mentioned in my previous blog that I gave this artwork of mine to the Director of both movies, Sir Jerrold Tarrog! And it feels great to be acknowledged by someone great in the filming Industry. 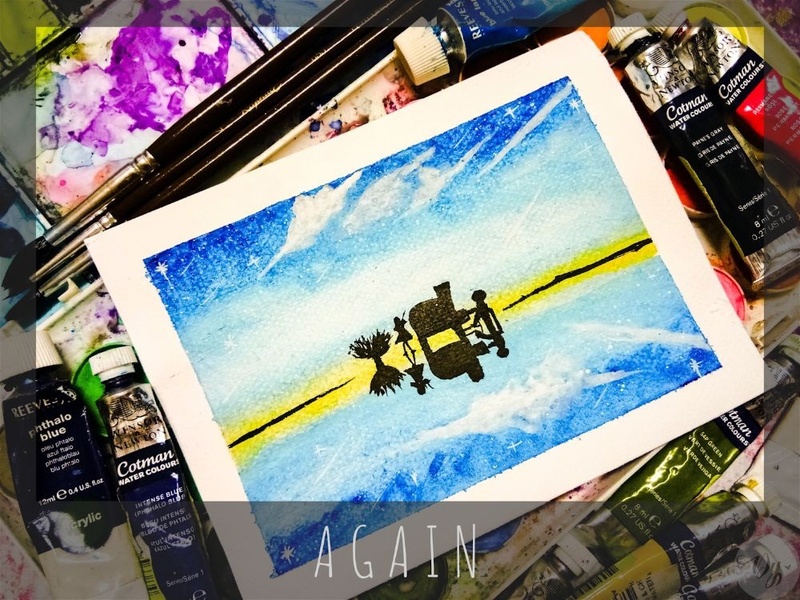 The last one in my Watercolor landscape Art summary is this Artwork inspired by the movie Goyo (Again). Gregorio Del Pilar is known as Agila (Eagle) in Philippine History. Aside from the Journey of Tirad Pass scene, this is one of my favorite. It speaks a lot of lessons not just in the life of General Del Pilar but also to everyone. His brother, Julian always reminded him of who he is. He's an Eagle. An eagle who soars high in the sky. But like every eagle, it has its own downfall as well. And this is General Gregorio Del Pilar's downfall. It's the end of him. But gladly, before he dies, it was an awesome plot twist that he realizes the wrong things he'd done in his colleagues and to this nation. I sometimes still hate him for pursuing his wrong decision and his selfishness. It was the downfall of Agila when the Filipinos started to fall in the hands of the Americans (Not to mention that it was Aguinaldo who sells our nation to those Foreigners) This is one sad reality. And there you have it!! 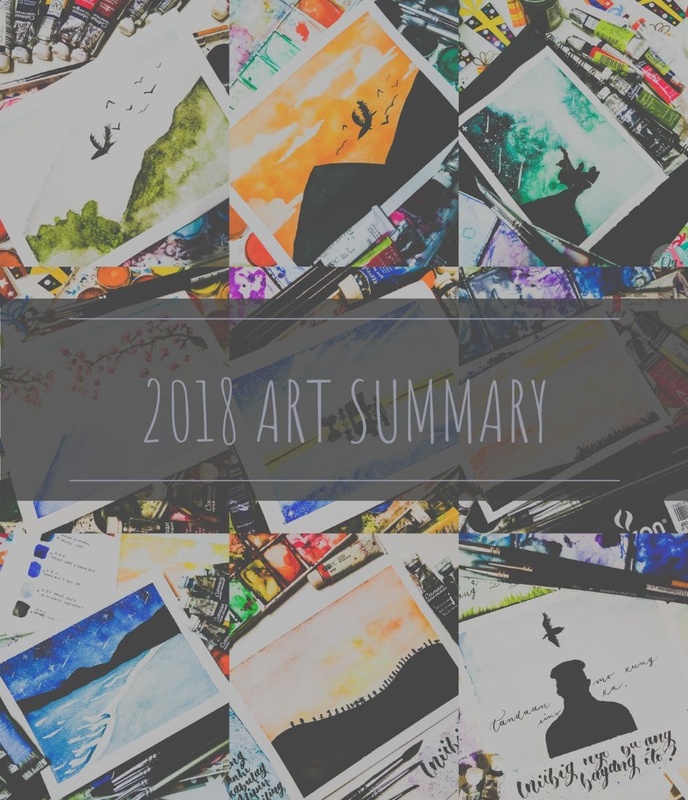 My 2018 Art summary “Watercolor Edition” I told you it wasn't that much! But I hope I can make more progress this 2019. Oh before anything else, Here's the list of the materials I used in all my artworks. Thank you for reading!! Have a great day!! do you happen to havr other blogs abour art painting? tutorials or any tips? nakaka inspired hehe congrats ate!